As a motorcycle fan, I feel excited to ride a newly-developed high quality street bike from Chinese manufacturer. The first sight of ARES150 made me enchanted. Its fashion-forward style with aerodynamics elements is eye-catching. I fell in love with this bike when it firstly stood in front of me. The stylish headlight and turn lights really catch eyes. The dazzling crystal headlamp has a clear shape. The front turn lights are designed in perfect integration with the decoration covering of the fuel tank, presenting its luxury of temperament. The cushion is made of a flawless curve and matches perfectly with the body. I could not wait to get on the bike. The well-designed leg position allows a comfortable riding gesture, and the shock compression return effect is perfect. The fashionable LCD meter lights to show speed, gear position, fuel level, time and rev data clearly as I turn the key to start the bike. It was rainy on the morning of the test day and we chose a country road first. To test the actual fuel consumption of the bike, we filled the tank with 5L fuel before riding, then, we started out. ARES150 carries a CBF150 engine. The vibration is small during start and acceleration. The noise is acceptable. I was excited and looking forward to the test ride of the day. The route of the ride was connecting the city and the countryside, so the road condition was varied. The rearview mirror gives a wide viewing angle and the road condition behind is clear and distinct. When I came across traffic jam, I could freely rode ARES150 through the vehicles on the road. This is the biggest advantage of a bike. ARES150 does make you feel light-hearted. I did not try many 150cc bikes before. ARES150 has a large torque. When the engine run at a low speed, I could keep the bike speed on most of the road surfaces, needless of changing over between the 2nd and the 3 rdgear. The gear shifting was quite smooth and easy, even when I wore boots. While riding passing curves, ARES150 showed good stability and I enjoyed it so much. The tyre maintained good road holding at any kind of curves. I could easily control the balance of the bike while entering a curve, and readily make turns before continuous curves. Although it rained for about an hour, ARES150 did not skid for a second on the wet road surface. The tyres function competently on the bike. 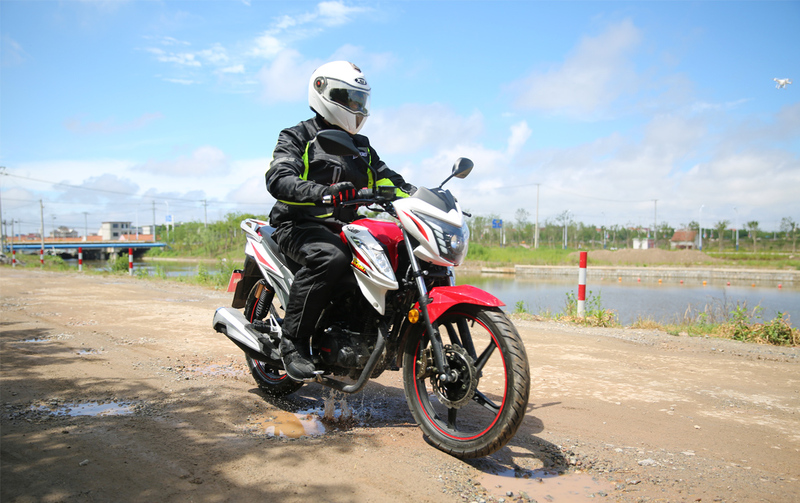 While riding ARES150 on uneven surface, I felt it rather stable and reliable. The shock absorption system can effectively reduce the vibration caused by the pot holes on the road, and I did not feel much shake on the bike. Besides, I did not get splashed while riding passing puddles on the road. We also rode onto a section of grit road, ARES150 still kept its stability. No worry about skid. I rode back and forth on a straight-line distance to try high speed riding. ARES150 output a maximum torque of 11.2N.m at 6000rpm, with great acceleration. Since there was no traffic control, I did not give it its best shot for safety's sake. 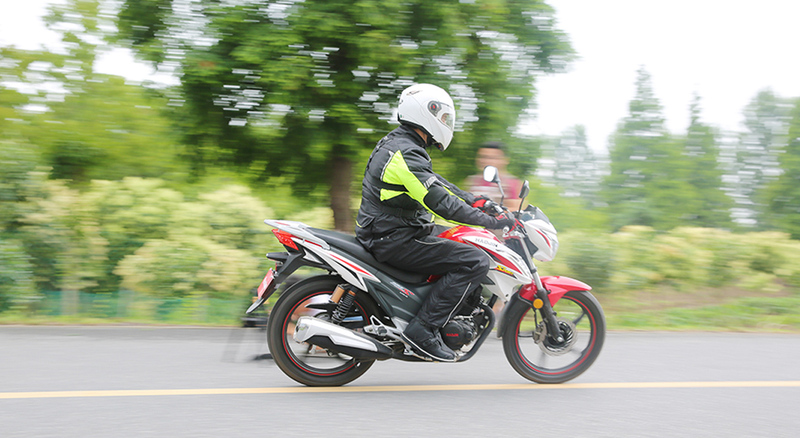 The highest speed I got was 102km/h, which is not comparable with a heavy motorbike, but well satisfies the riding requirement on common streets. According to Haojin’s engineer, Haojin is going to bring out a future edition of larger displacement to give this bike more power and faster speed. This test ride covered a total distance of 200km. I run at an average speed of 85km/h on different roads and in different weather conditions. When I rode on the coastal levee and into Evergrande Venice Resort where there was less traffic, the CBF engine performed remarkably at middle and low speed. You feel strong push back at slight acceleration. The 200km riding passed urban area, coastal levee and Evergrande Venice Resort, and ARES150 showed its stability, reliability, and durability on various kinds of road surfaces along the way. Since it was an ordinary test ride this time, I did not wear much protection gear for the test ride. The most appropriate and workable speed on the street I suggested was 75km/h for usual status travel. 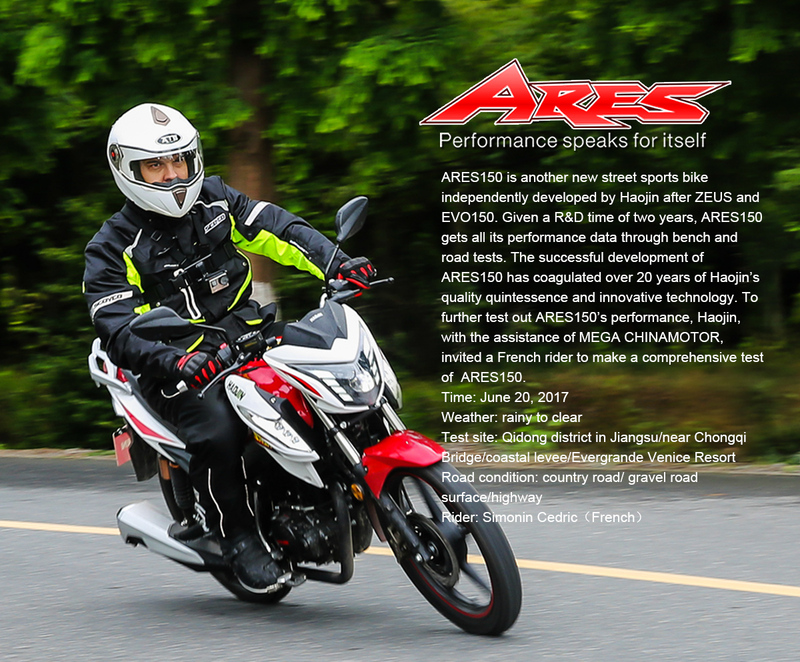 ARES150 is most suitable for riding on urban roads and narrow streets. All the way during the test ride, the logistical support team was asking me via a walkie-talkie if I had used up the fuel. My answer was always negative. It is hard to believe that the 150cc bike can finish the whole test ride with 5L fuel, considering the complex traffic and road conditions. However, ARES150 made it. After finishing the test ride, we poured the remaining fuel in the tank and measured it to be 0.2L. Thus, the fuel consumption was calculated to be 2.4L/100km ((5L-0.2L)/200km). As a motorcycle fan and test rider, I have seen and ridden different types and displacements of models, but ARES150 impresses me in many aspects. The vanguard design is full of sports elements. It is powerful and fuel-efficient. You can experience a steady, comfortable motorcycle travel and meanwhile a wild riding pleasure. I believe ARES150 has advantage in its appearance, performance and fuel consumption, comparing with the same models of different brands. Trust me! ARES150 is a reliable bike that will bring you safe and relaxed travel experience.